If you go to Prambanan Temple, there's a love story which is shaped on its wall. It's Ramayana love story. The story came from India thousands years ago. Based on an epic Hindu history, the story was began on a contest of Prabu Janaka, who looking for a husband for his daughter, Shinta, a beautiful and charming princess. Some tests were hold in order to get best from the best. Then, Rama Wijaya got Shinta's love, at once won the contest. They were falling in love on a first sight. A big war happened between Prabu Janaka and Rahwana, hundreds of soldiers, weapons and tactics were used by both kings. But, Prabu Janaka's kingdom was on crisis; his ability couldn't fight against Rahwana. A white monkey, Hanoman, was being a hero for saving Shinta. The princess was free, back to Rama. But, the trouble still haunted their love. He was asked Shinta to jump down in a fire. Then Shinta was done it indeed! The miracle was came, Shinta hadn't burn at all, whereas she became more beautiful then before. Rama felt sorry then the story is ended in happy ending. If you want to see the complete story, you have to see Ramayana Ballet in Prambanan temple ground. 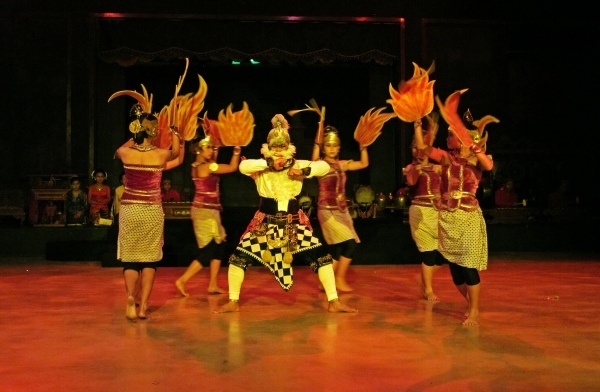 Based on an epic Hindu history, the story was adapted to become an important local dance, encompassing the Javanese style, culture and music. Whilst the story originated in India, the Javanese version is truly representative of the local art and culture. In the evenings, this ballet comes to life, enacted by over 200 professional dancers and musicians on an open air stage that takes advantage of the Prambanan Temples as a backdrop. The performances run from 7.30pm to 9.30pm. Not just dance, but you can hear gamelan music, feels night wind, and take up full moon into your soul. The dance will hold in night, on outdoor stage, at the best angle of Prambanan Temple. From distance at outdoor stage, you can see silhouette of the temple. The most interesting part in the Ramayana story is battle of Rahwana and Prabu Janaka. Fire attraction is combined by laser lighting and acrobatic martial art between performers. Sometimes they jump, roll on or fly! Please, preparing your camera if you're decided to see the Ramayanan Dance, you will shot interesting movement, collorful fashion and unpredictable movement.